Well, I've decided to challenge myself again this Spring. I tried it in the Fall and didn't get anywhere near the reading done I thought I would. So, I'm going to try and be as light on myself as possible. I'd like to thank Callapidder Days for hosting this Reading Challenge! If you'd like to learn more about the challenge or to join, head over to Callapider Days. 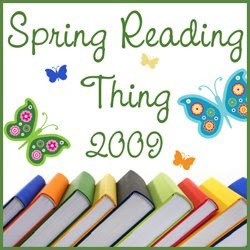 Love to see Talking to the Dead on your Spring Reading Thing 2009 list! I look forward to your reviews of the religious books! Hi. Thank you for stopping by my blog. I did read the Princess Kiss to my girls and my eyes watered-sigh. I pray that they will hold onto that special kiss until their wedding day. I just picked up The Apothecary's Daughter. It isn't on my list but I saw a wonderful review about it on 5 Minutes for Books. Your list looks fantastic. Happy reading. that's quite a few books. hope you do well by your own standards. enjoy your books! I will let you know about The Book Whisperer. I just ordered it from Amazon.com. I can't wait to read it myself. I have a 9 year old that likes to read, but is very picky about what he reads and will re-read books instead of trying new ones. I am hoping this book will give me some suggestions. Sounds like you will be busy! I'm sorry to say I haven't heard of any of these books so I don't have any comments for you! thanks for stopping by my list ... I appreciate your input. And just to let you know, "The Ridiculous Race" is non-fiction -- two guys decide to race around the world in opposite directions and see who makes it back to Los Angeles first. And they can't fly! It looks pretty fun. I love travel narratives with humorous spins so I think it will be a winner. Looks like you will be a busy little reader this spring :). The only one I've read is Get Out of That Pit, and I enjoyed it. Hope you like it, too. Great list for your spring reading. I have some of the same books on tap as well. I'm counting the days until Passion Denied by Julie Lessman comes out in bookstores! She is a tremendous author - I love her books!